When your mobility is compromised, don’t let multi-level living keep you from enjoying your home’s outside spaces. 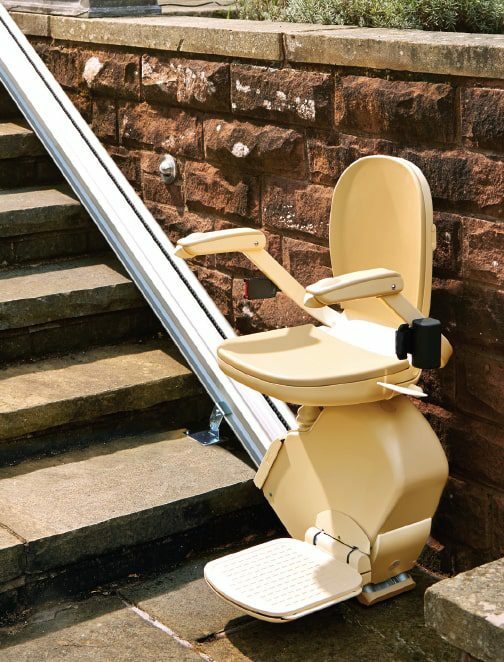 With an outdoor stairlift, you can navigate your property’s ups and downs. Whether entering the home, garage, a deck, or patio, you’ll be able to reach new heights. That’s why at Home Healthsmith, we install outdoor stairlifts for elderly or disabled clients in Rhode Island. According to The American Journal of Emergency Medicine, about 1 million Americans are injured and have to be treated from a stair-related fall every year, with older people being among the more frequent victims. In fact, the CDC claims that falls are the leading cause of injury in older Americans. Something that’s preventable shouldn’t be such a problem in the elderly community, which is why Home Healthsmith is dedicated to helping you not become a part of this statistic. If you’re going to get something to help you with the stairs, you’re going to want it to be efficient and reliable. There’s nothing wrong with being cautious when it comes to moving around, so going with the Brooks Stairlift could be the right option for you. In addition to the aforementioned design, these stairlifts have a padded seat, backrest, and a convenient, secure, retractable seat belt. It weathers the elements beautifully, as the seat post is 100% stainless steel and the electrical systems use fully sealed cables. This means it can keep functioning during power outages. Also, the maximum capacity is 300 pounds, though there is an option for 350 pounds as well. The slimline motor provides years of smooth, steady service, so don’t worry about having to replace yours for a while. An outdoor stairlift can make navigating your outdoor spaces easier, and our teamof expert installers will be with you every step of the way when you choose to work with us. Give us a call at: 401.293.0415 or email us at: info@homehealthsmith.com to make an appointment to learn more about these sturdy and attractive safety additions to your property.